Nobody wants to fall sick and miss a day at work. Or miss the quality time with your family. In order to avoid falling sick, you need to boost your immunity. Your immune system is a complex and active machinery that protects your body from infectious organisms and allergens, together known as antigens. 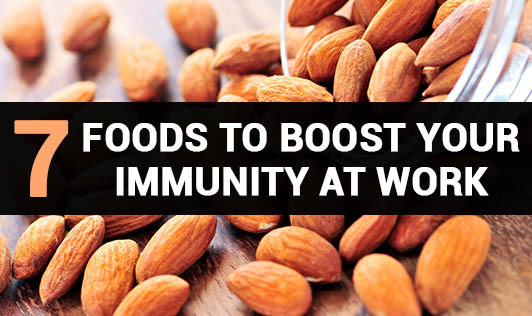 Your body’s protector cells depend on the food that you eat to work efficiently. Maintaining a good supply of antioxidants is perhaps one of the most important things that you can do for maintaining good immunity. 1. Green tea : It helps to fight off the body infection and increase the immune system. A report shows thatpolyphenols in green tea may be linked to skin-cell rejuvenation. 2. Garlic : The time-honored remedy for many diseases big and small does work as an immune booster. Scientists attribute this action to compounds called Allicin and Alliin found in garlic. If you love the pungent taste of garlic, then you would probably not mind chewing a few raw cloves. 3. Almonds : Almonds are rich in phyto-chemicals . It promotes a healthy immune system and positively affects hormones. They also act as antibacterial and antiviral agents. They offer you smooth and glowing skin. 4. Grapes : Regular consumption of grape juice benefits human immunity. Grapes have long been classified as a low glycemic index (GI) food, with GI values ranging in between 43-53. Grapes have also been shown to contain the hormone and antioxidant melatonin that have anti-bacterial properties. 5. Broccoli : Broccoli is already known for its health benefits in the nutrition world, particularly for its cancer-fighting abilities. The results of the study indicate that a chemical in broccoli known as sulforaphane activates certain antioxidant genes and enzymes in specific immune cells that can battle the damage from free radicals. 6. Walnuts : The anti-inflammatory properties of omega-3 fatty acid present in walnuts helps in building the natural immunity of the body against many diseases. Walnuts provide protection against diseases like cancer, asthma, rheumatoid arthritis, eczema and psoriasis. 7. Lemon/lime juice: Lemon energizes the body and helps the immunity system to re-energize itself. As it is rich in vitamin C , immunity power increases and common cold will be reduced by taking lemon juice regularly.